Bringing you all some springtime vibes with these Greek Lemon Chicken Bowls with Sizzled Mint Goddess Sauce. 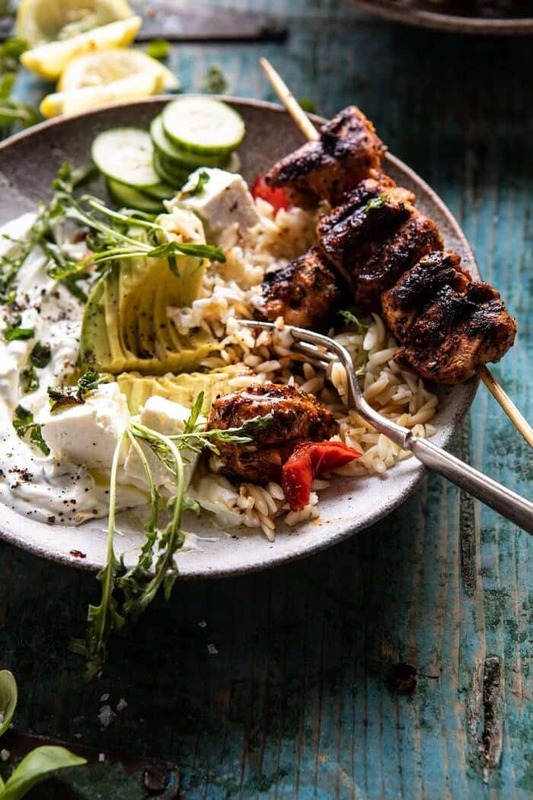 Grilled Greek chicken (or roasted), served bowl style with orzo, roasted peppers, avocado, feta cheese, cucumbers, and the most deliciously addicting sizzled mint goddess sauce. 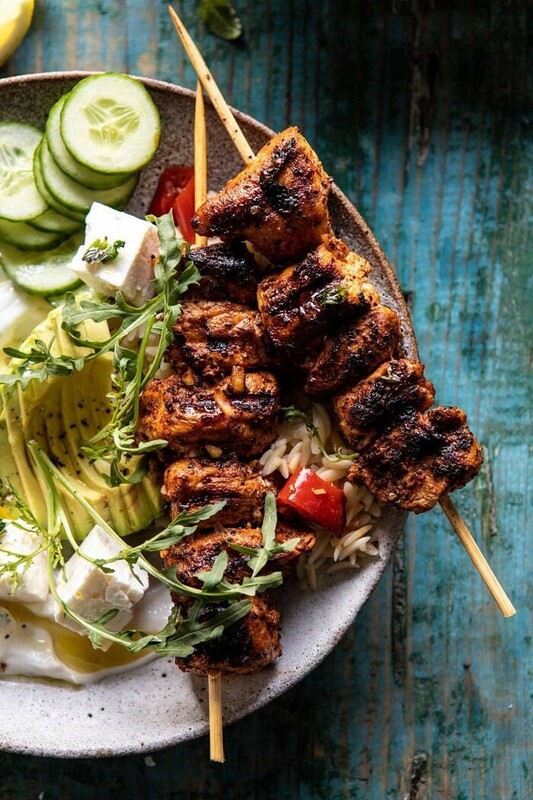 It doesn’t get easier or more delicious than this grilled chicken…simple, quick, extra colorful, super flavorful, and so delicious. The perfect dinner to serve any night of the week! Basically I am full on ready for summer, and this recipe proves it. I know it’s only mid April, but in my defense, I feel like most everyone (in the US at least) is slowly beginning to experience warmer days that are fit for grilling. Are you? My fingers are crossed that you are, but if not, don’t worry, you can easily roast this chicken too! Either way, this is the perfect recipe for Monday. It also feels very April appropriate – healthy, colorful, and delicious! All very important things. With Easter this Sunday, I have Greek food on my mind. Something about Easter always inspires me to create recipes with a Greek influence. I say influence because I know that my recipes may not be traditional, but this is my personal spin on a more traditional recipe. Last year I even made my first spanakopita (Greek spinach and feta pie), along with these Greek orzo stuffed peppers! Both of which are some of my favorite spring and summer recipes. And then there’s these Greek lamb meatballs, which so many of you have made and seem to have loved. Those meatballs inspired this recipe. Ever since I made those meatballs a year ago, I have been obsessed with the recipe. I make it every chance I get, which honestly is not often enough, as I’m consistently testing new recipes. Point is, I love the flavors so very much, but more often than not I end up having chicken on hand opposed to ground lamb. Soo, enter the chicken version of these bowls. But made in a very different way, because well, I never seem to make the same recipe twice. 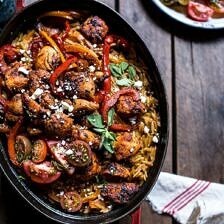 Both bowls are SO GOOD, but right now I am all about this Greek chicken. And it feels kind of fitting for Easter, doesn’t it? I marinate the chicken in quite possibly one of my favorite marinades. It’s a combination of olive oil, balsamic vinegar, smoked paprika (which is not really “Greek”…but it’s good), fresh oregano, shallots (the secret! ), garlic, and lots of lemon (always so much lemon). Now, when I say marinate, I really just mean toss the chicken in this mix and let it sit while you get everything else for the bowls together. I’m not sure about you guys, but I can never plan ahead enough to cook a recipe requiring a long marinate time. So, I do a quick marinade. It works. While the chicken is “marinating”, make the sizzled mint goddess sauce. Here’s the truth, I really do not love mint. I find it overpowers most recipe. Unless it’s a cocktail, in which case I think mint is perfect, did you see these mojitos? Mint used in savory dishes however, well it throws me off. Until today. Cooking mint in olive oil really mellows out the flavor and makes the mint much less pungent. I found it to be perfect when stirred into a yogurt based goddess sauce. Which I am now spooning over everything, so addicting. Roasted salmon and potatoes are especially delicious. Once the sauce is made and the chicken is grilled, it’s assembly time! I used orzo pasta as my grain, but feel free to use quinoa, couscous, or brown rice. Any would be great. I then layered in some roasted red peppers, avocado, cucumbers, olives, and even some arugula. Lots of veggies… and a good amount of feta cheese too. Super pretty, on the (very) healthy side, and so very delicious. The added bonus about this recipe is that it’s so great for weekday meal prep. I recommend making this on a Sunday or Monday night and doubling the recipe. Then simply use the leftovers to make lunch or dinner bowls to enjoy throughout the week! Cook everything at once…get multiple meals…love that! So excited to be sharing this recipe with you guys. It’s one of those dishes I just know you will love! 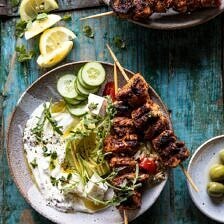 If you make these Greek lemon chicken bowls, be sure to leave a comment and/or give this recipe a rating! Above all, I love to hear from you guys and always do my best to respond to each and every comment. And of course, if you do make this recipe, don’t forget to also tag me on Instagram! Looking through the photos of recipes you all have made is my favorite! 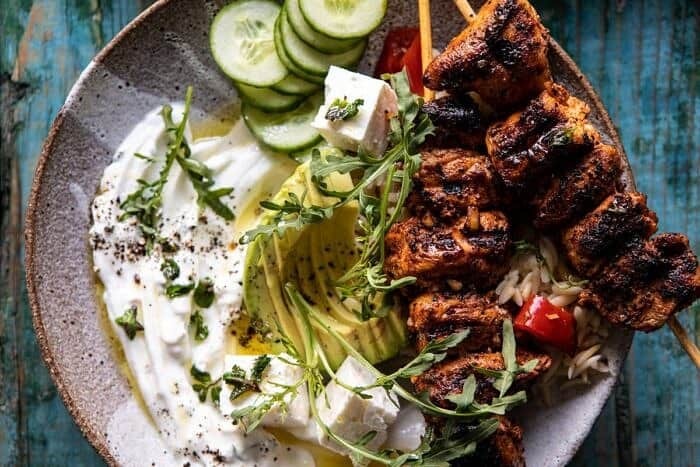 Grilled Greek chicken, served bowl style with orzo, roasted peppers, avocado, feta cheese, cucumbers, and the best sizzled mint goddess sauce. 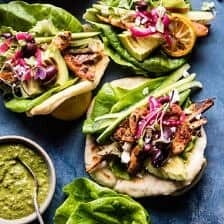 Quick, easy, extra colorful, super flavorful, and so delicious! 1. 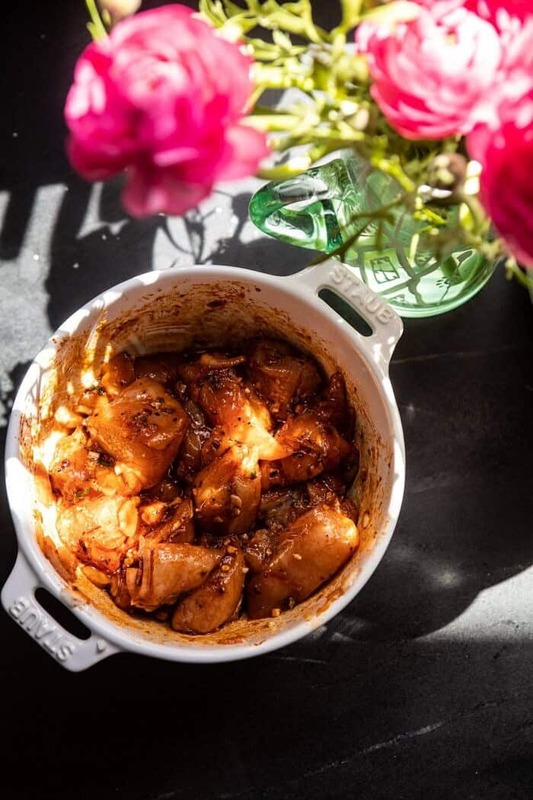 In a gallon size zip top bag, combine the chicken, olive oil, balsamic vinegar, paprika, oregano, shallots, garlic, lemon juice, lemon zest, crushed red pepper, and a large pinch of salt. 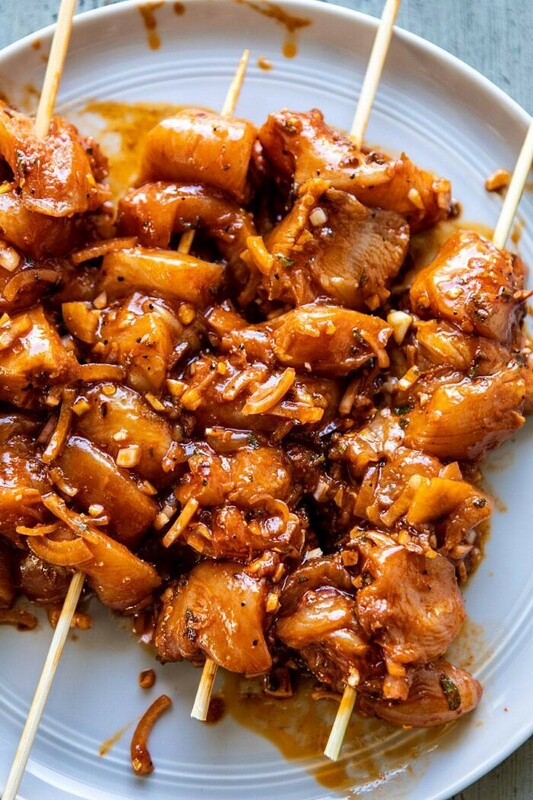 Marinate for 15 minutes or up to overnight in the fridge. 2. Meanwhile, make the yogurt. Heat the olive oil in a small skillet over medium heat. When the oil shimmers, remove from the heat and stir in the mint, it will sizzle up. Then set aside. 3. In a medium bowl, combine the yogurt, basil, lemon juice, jalapeño, cumin, and a pinch of salt. 4. Set your grill, grill pan or skillet to medium-high heat. 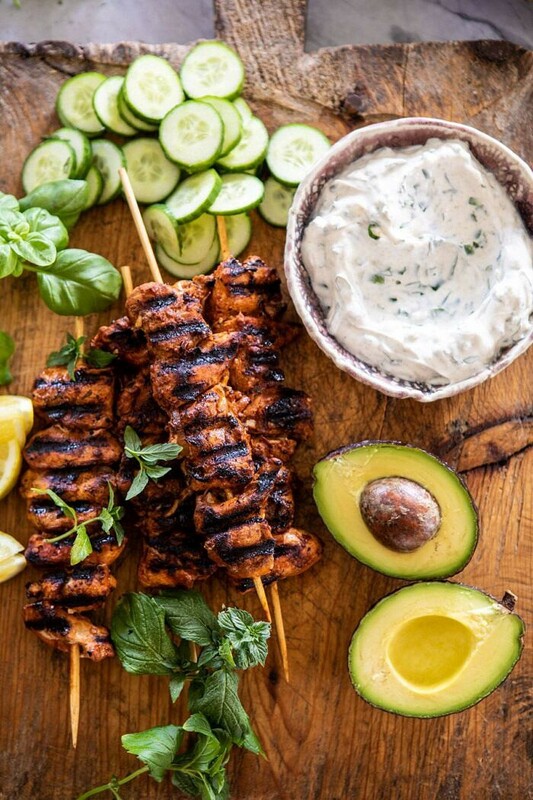 Take skewers and thread the chicken pieces on. Alternately, you can roast the chicken at 400 degrees for 20-30 minutes. 5. Grill the skewers until lightly charred and cooked through, turning them occasionally throughout cooking, about 10 to 12 minutes total. 6. 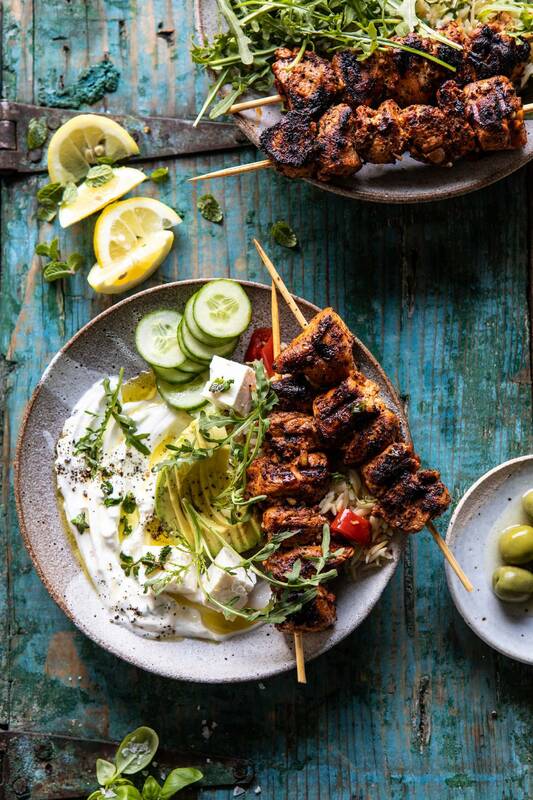 To serve, spread the yogurt sauce onto plates and drizzle with the mint oil. Add the orzo, peppers, feta, avocado, cucumbers, olives, and chicken. Sprinkle on some greens and herbs. Enjoy! Greek Goddess Chicken Lettuce Wraps. 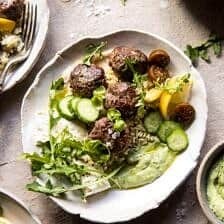 Greek Lamb Meatballs with Avocado Goddess Sauce. 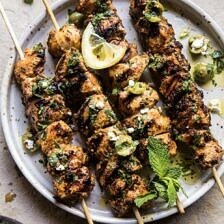 Moroccan Grilled Chicken with Herby Lemon Olive Vinaigrette. ohhh yum, this reminds me of Summertime!! Is the oregano supposed to go in the bag to marinade? Sizzled mint goddess sauce sounds like an acro-yoga term or something. I love it! I would have to agree with you that recipes like your Lemon Chicken Bowl, just don’t get any easier and more flavorful than this. 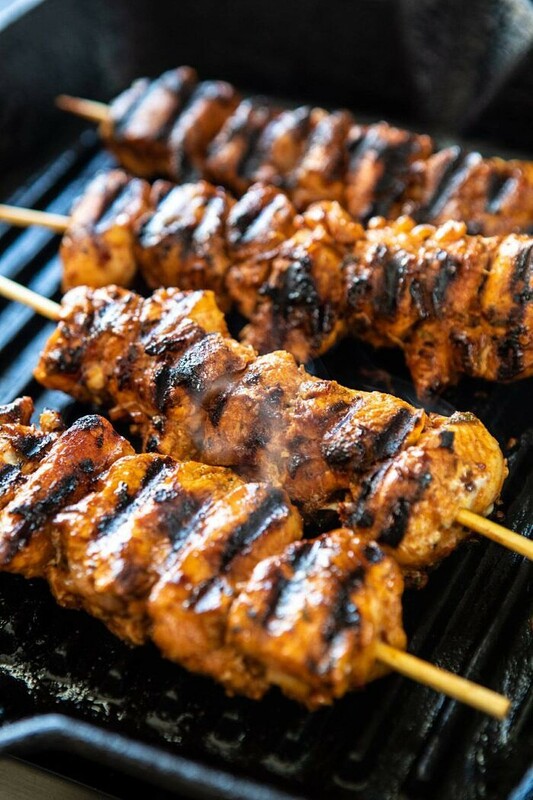 And I do love that it’s grillin’ time where I live in the Midwest and I can’t wait to try these lovely chicken kabobs on the grill. As always, thanks for sharing. This looks so good! Question – does that calorie information include the orzo you have on the side. Forgot the paprika….added pickled onions. Didn’t matter. Man we love your recipes. Read the recipe this morning and couldn’t wait to make it. Ran to the store to get the dill and made it tonight. I used chicken strips and cooked them in my grill pan instead of the skewers (easy-peasy). Roasted some cauliflower and mushrooms along with the bell pepper and everything was delicious as usual. I just love all the amazing flavors your recipes contain. THANK YOU!!! I just discovered you recently and I am hooked. I sent your link to my kids who are probably around your age, 23 and 26. Anyway I’m going to make this tonight. Looks delish. I wanted to know if those bowls are available for sale anywhere. I need some bowl plates as i only have bowls or plates. I’m eating much more delish since I discovered you, Thank you! My husband is on a restrictive diet for two mos..I think this recipe would work all except for the yogurt.. could I replace it with coconut milk? So good! I already made this twice this week, once with chicken and again with cauliflower florets in place of chicken – both were amazing. I used Israeli couscous instead orzo because I had it on hand and it turned out great. 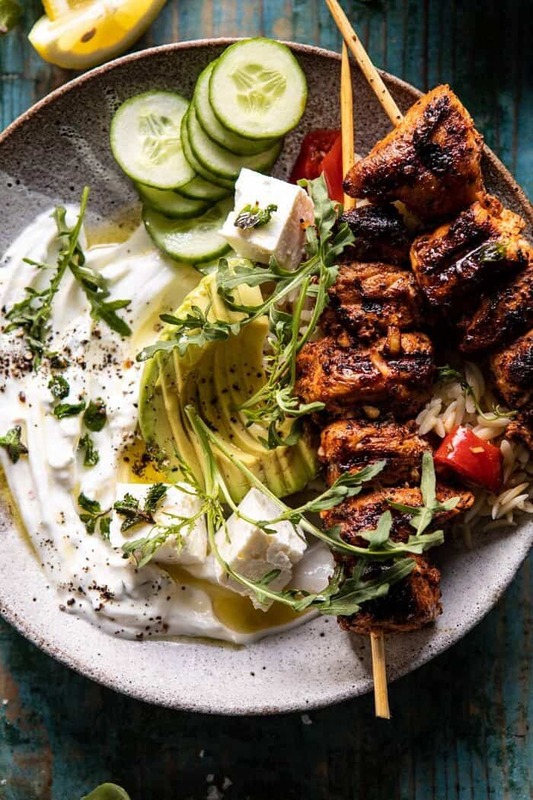 So easy to make and that chicken marinade is going to be my new go-to. Made this for dinner the other night and it was delicious! That sizzling mint oil is amazing! Made this tonight (in a slightly different variation – added sweet potato fries and skipped on the couscous) and it was delicious! Seriously easy and delicious. For the jalapeno in the yogurt sauce – it just says to seed and half them, and then to combine with the other ingredients. I inferred I should mince the jalapeno, which worked well; although I ended up having a VERY spicy jalapeno so I didn’t use the whole one. The other thing I wasn’t sure about was the roasted red pepper. I bought a red bell pepper and roasted it in the oven, but I wasn’t sure if the intention was to include the roasted red peppers you can buy in a jar from the grocery store.